Your home was assaulted be the evil creatures of the dark and everything you loves is lost. Don't wait for your death in sorrow and fight those creatures, hoping that someone will come and help you. This old fort is your new home and the place where you will start the resistance. 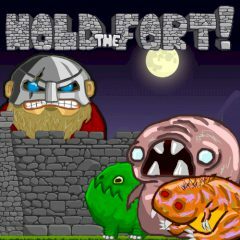 Don't let those nasty creatures destroy the walls of the fort at the night time. Accept the survivors and fight together, resisting the enemy as hard as you can. Place traps, harden the walls and make your fort unreachable for the enemy. Games Similar Hold the Fort!